Our drive to Khambula following the route of Evelyn Wood's invading force on the left hand flank of Chelmsford's invading army took us through pine forests and along sandy roads to a point which was less than a day's march from Mount Hlobane where the British had been defeated by the Zulus on the 28th March 1879. It was at Khambula a day later that the lessons learnt so harshly at Isandlwana would be applied - with severe implications for the Zulu nation. For Khambula was most certainly the turning point in the Anglo-Zulu War of 1879. British Redoubt facing the Zulu Right Horn (Zinguin Hills top right). Unlike Isandlwana the British camp at Khambula was compact and well prepared for close defence. The picture above shows part of the outline of a redoubt constructed on the crest of a dominant ridge. This position which accommodated the commander, two companies of infantry and two 7-pounder guns of the Royal Artillery was about the size of two tennis courts. The perimeter was built up using rocks, stones and sods of earth. About 150 yards to the West of this redoubt, about 100 transport wagons had been parked nose to tail to form a lopsided square. This main laager was defended by about 1,000 men from the 1/13th and 90th Light Infantry. Within the laager was a hospital, all supplies and about 700 saddled up horses. Around the perimeter the defenders could make use of a defensive trench and a double height firing step. A further small laager of about 40 wagons was fortified to protect oxen and cattle. This was defended by a single company of the 13th Light Infantry. The main British Firing Line looking South from the crest of the ridge. The attacking Zulus were at the height of their confidence. They had defeated the British at Isandlwana two months earlier, bottled up the army protecting Chelmsford's right hand flank in Eshowe and had achieved impressive tactical victories at Intombe River and Hlobane. The army was 21,000 strong with it's fighting heart made up of the 6,000 strong Nkobamakosi regiment, average age 24. A formidable force set on crushing the 2,086 men under Wood's command. Sharing information with the locals. In his excellent book 'Blood on the Painted Mountain - Zulu Victory and Defeat: Hlobane and Kambula 1879' Ron Lock (whom I had met on Spioen Kop a few days earlier) quotes an extract from Cetshwayo's battle orders; "You are not to go into the hole of a wild beast or else you will get clawed - wait until the soldiers come out of their laager and then fall upon them'. On the 29th March the Zulu army had been observed all morning. The defenders were ready at midday when the Zulus deployed along a six mile front. Rather than wait for the Zulu commander, Mnyamana, to pick his lines of attack Wood decided to provoke a premature charge. A couple of troops of horsemen did the trick by dismounting 300 yards in front of the massed Zulu ranks and firing a powerful volley. The Nkobamakosi came on and the others followed. The resultant ill disciplined attack achieved little and the Nkobamakosi retreated to an outcrop of rocks some 400 yards distant. The remaining bulk of the Zulu army attacked some 45 minutes later. The momentum forced the British defenders of the cattle kraal back. Zulu snipers managed to find shelter in the dead ground immediately below the lip of a ridge running parallel to the British positions (see pictures above and below). A counter attack with fixed bayonets by the 90th Foot retook the cattle kraal. The battle then moved into its' critical phase with waves of Zulus coming on in the face of massed fire from the main Kraal and the smaller hill top redoubt. 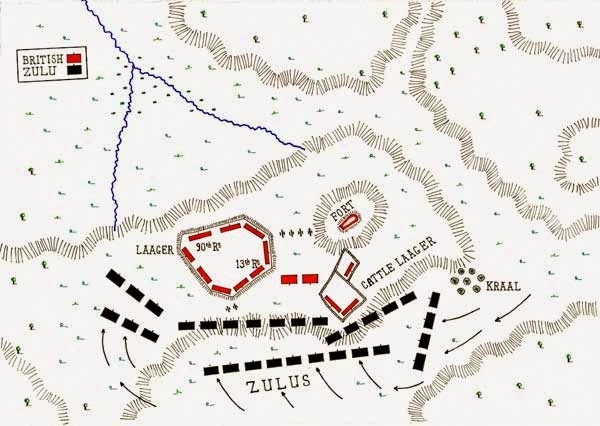 The tide turned decisively when two companies of the 13th LI were deployed on the edge of the ridge to fire into the Zulus who were massing for a final charge. The position is shown from the side in Prior's painting and looking towards the Zulu Lines in my photo - both images above. As the Zulu army faltered the British cavalry and mounted infantry - some 600 strong - moved to attack the retreating warriors. All was finished by 6:30 in the evening and the next day a review of the casualties showed 83 British killed and wounded. The Zulus lost 800 in the immediate vicinity of the British camp and as many as 1500 along the lines of pursuit. The Zulu nation would never be quite the same again. Click here for the Battle of Hlobane. Click here for photos of Kambula. 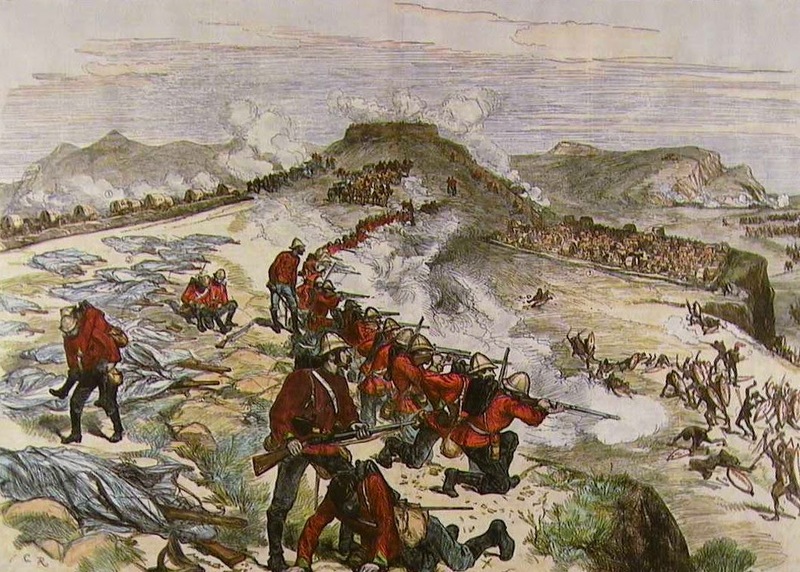 'Blood on the Painted Mountain' was the description used by Ron Lock as a title for his authoritative book about the Zulu victory at the Battle of Hlobane on the 28th March 1879. 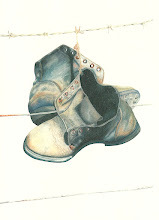 Published in 1995, the book tells the story of Hlobane and the subsequent British victory at Kambula - just one day later. Last month I had the pleasure of meeting Ron - albeit on a battlefield belonging to a different generation - Spion Kop. The Zulus in this part of their homeland (the abaQulusi) were separated by some distance from the main Zulu power base in Ulundi. No.4 Column of the British invading force under Evelyn Wood had been charged with eliminating what was felt to be a relatively isolated Zulu force. There were an estimated 1,000 Zulus on the mountain with a large number of cattle. Wood attacked with a contingent of 614 mounted troops. The picture above shows the mountain from end to end. The lower plateau on the right was the objective of Lieutenant Colonel John Cecil Russell. The upper plateau on the left - or to the East - was to be taken by Lieutenant Colonel Redvers Buller. Our small group was being advised by Major Paul Naish, a longstanding friend of mine and an authority on African military history. 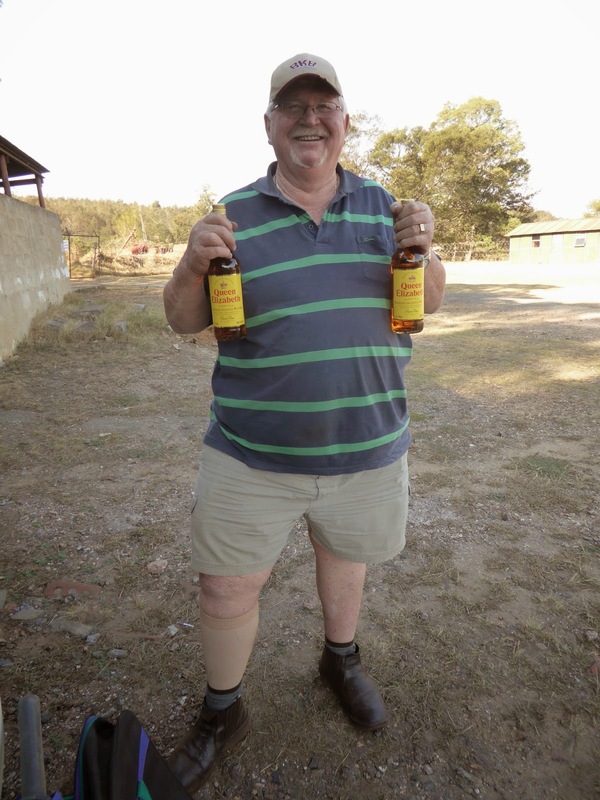 Paul managed to secure a 4x4 vehicle in exchange for two bottles of whisky and we were therefore able to cover all of the main areas of interest on this fascinating battlefield without several hours trekking from point to point. The entry point is through a decaying mining town called Vryheid and we parked up our vehicle and switched to an open backed truck in the old coal yard. Our first stop was above the Intyentika Nek where a force of about 80 men from the Border Horse along with Barton's Squadron of the Frontier Light Horse were cornered by Zulus (only 7 escaped). Unfortunately for Wood and his relatively small command, the opposing Zulu force had been massively bolstered by an army of more that 20,000 warriors heading for No. 4 Column's camp at Kambula, just a few miles away to the North. The colonial riders had been caught by surprise and had nowhere to go. On the opposite side of the mountain lies the main track up to the plateau. This had been the route taken by Buller as he executed the attack on the Eastern end of the mountain. Wood and a small group of his staff officers had followed the route shortly after Buller had made the ascent. This understrength party were astonished to find themselves opposed by Zulu (abaQulusi) snipers hidden in the rocks just below the skyline. It was here that one can find the only remaining British war graves. Those of Captain Ronald Campbell of the Coldstream Guards and Llewllyen Lloyd a civilian interpreter. Both were killed when they tried to press forward unaware of the fact that the Zulus had arrived in strength and frustrated that the Border Horse contingent were moving away from the scene of battle having become separated from Buller's main force. 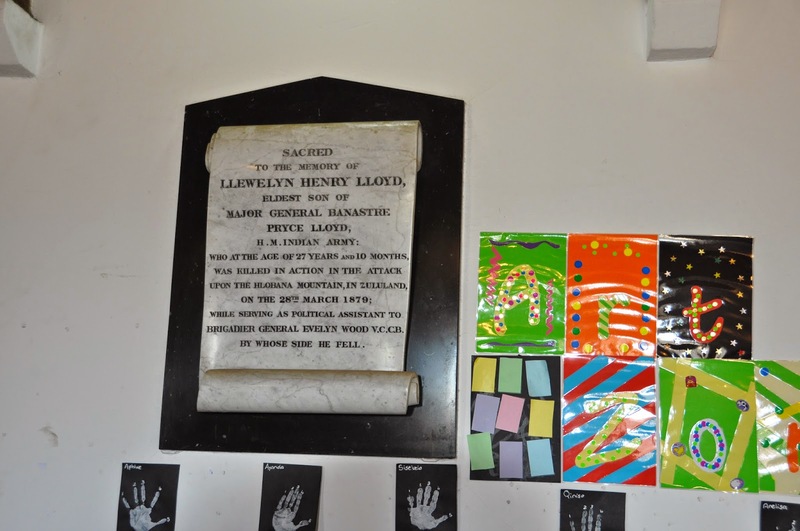 (A few days earlier we had come across a memorial to Lloyd in St John's church, Mooi River back in Natal). It is a bumpy ride up to the high plateau. On the top the ground is rocky but flat. We travelled up in winter time but in the summer I am told that it is a sea of lush green grass. Buller's force, realising their predicament, fought a fighting withdrawal away from their route of ascent but towards the intersect with Russell's force which they assumed would have secured the lower plateau. Unfortunately Russell had withdrawn from the mountain having received an ambivalent order from Wood who was now aware of the size of the opposing force. Buller was on his own! The fighting on the top of the mountain was intense with the British force desperately trying to link up with Russell and find a way off the mountain. Russell was gone, so the only way out for the survivors was via a steep decline known as the Devil's Pass which lead down to the lower plateau, known as Ntendeka Nek and shown on the photograph above. It is difficult to imagine how mounted men could have navigated their way down this slope - and many never made it. The survivors made for Kambula hotly pursued by Zulu warriors. I will cover Kambula in a future blog entry. My Flickr photo set for Hlobane is here. 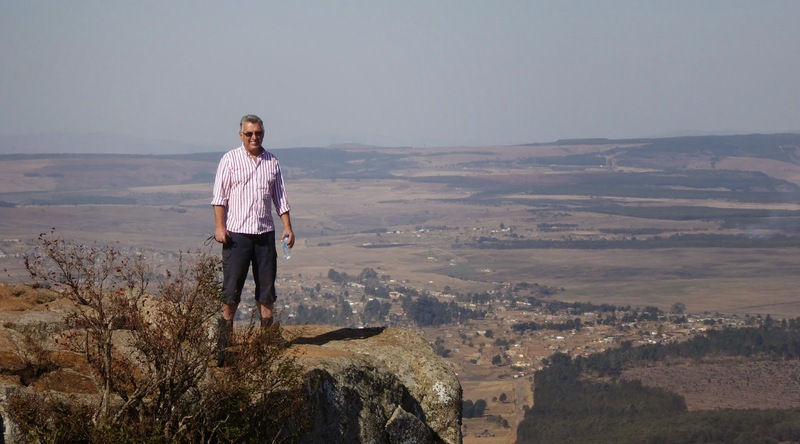 The story of the Fugitives Trail at Isandlwana can be found here. The Battle of Kambula can be found here.